Seattle Reads has begun and the Columbia Branch library book club kicks off the season on Monday, March 21 at 6:45 p.m. by reading and discussing the book, Little Bee by Chris Cleave. Narrated alternately by Little Bee and Sarah, the novel also features Sarah's young son, Charlie, who refuses to take off his Batman costume and whose "goodies/baddies" worldview leavens an otherwise dark story. "Little Bee" explores identity, morality, and compassion; refugees and asylum; friendship, marriage, and parenting. There are Seattle Reads events all over town for the next several months, including opportunities to meet the author, dramatic readings performed by Book-It Theatre and airings of documentary films. 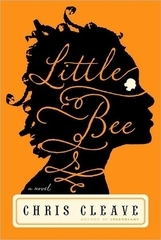 There are also many, many other book clubs reading and discussing "Little Bee" through June 14, so if you aren't able to attend the March 21 meeting, look for one of the others. For further information and a Seattle Reads program brochure, please visit Seattle Reads.